The Meiji period (1868-1912) was very dynamic in many ways because of new thinking, modernization, radical change, and a plethora of other factors, altered the cultural landscape in all major cities. However, the countryside often ticked to a different beat despite important reforms and major changes in the area of agriculture and amenities. In the field of ukiyo-e art, it appears that the crème de la crème of Meiji ukiyo-e artists have been relegated or not acknowledged fully. After all, the emphasis in the past is mainly focused on ukiyo-e artists during the Edo period. Despite this, it is clear that you have many important Meiji ukiyo-e artists who blessed this art form. This notably applies to Chikanobu, Kawanabe Kyosai, Ogata Gekko, Yoshitoshi, Toyohara Kunichika, Utagawa Yoshifuji, Mizuno Toshikata, Kobayashi Kiyochika, and Ginko Adachi. The list could be added and for some of the above artists then clearly they began their careers during the Edo period but on each above individual, the Meiji period impacted greatly on their art. Obviously, the dynamics of the time would inspire new thinking and creativity and the new vibrant color palette enabled new dimensions to develop. Other areas like multiple perspectival lines and detailed composition meant that times were changing. Of course, it is important to avoid generalizations. After all, ukiyo-e artists in both periods of history, or who belonged to both the Edo period and Meiji period, had certain trademarks which belonged to each individual artist. However, the impact of modernization and the threat to ukiyo-e because of this meant that new focuses were needed in order to survive the Meiji period. The reputation of some Meiji ukiyo-e artists is starting to grow and long may this continue. 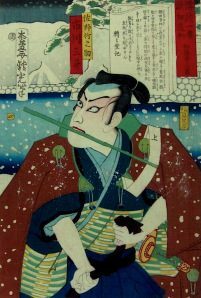 In the history of ukiyo-e, the artists of the Meiji period had it hard because often the greats of the Edo period overshadowed them in popularity and international prestige. Also, unlike the ukiyo-e artists of the Edo period, the changing world was challenging this art form because of multiple factors. Therefore, innovation was needed during the Meiji period because the power of photography was constantly growing – and different art forms were gaining greater attention internally – once Japan began to open up to the outside world. Yet despite everything the artwork of Chikanobu, Kawanabe Kyosai, Ogata Gekko, Yoshitoshi, Toyohara Kunichika, Utagawa Yoshifuji, Mizuno Toshikata, Ginko Adachi, Kobayashi Kiyochika, and other Meiji ukiyo-e artists, was truly amazing. Therefore, each individual mentioned left behind many stunning pieces of art and they all provide a glimpse into the changing times of this period. Meiji ukiyo-e artists – just like Edo ukiyo-e artists – should be judged on a case by case basis which applies to the art they produced. Of course, differences will apply based on multiple factors but the issue shouldn’t be the period they belonged to. Instead, it should solely be based on the art they produced because both periods of history blessed the art world. Some art and cultural articles by Modern Tokyo Times are republished in order to inform our growing international readership.